Charter Broker magazine will be published bi-monthly through 2019, providing a unique and highly effective advertising vehicle for all business air charter companies worldwide. Printed copies are sent to every air charter broker, and the electronic edition to every business charter operator. Here is our readership circulation statement for the December 2018 edition. 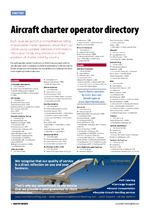 From October 2016 every issue of Charter Broker magazine has included a directory listing of worldwide air charter operators. Every charter operator taking display advertising in the magazine is highlighted in this directory free-of-charge for one year. See our online 2019 media brochure for more details of the coming year, or download a pdf.